The International Affairs Department of Kansai University, one of the most prestigious Universities in Japan, hosted Shin Koyamada's lecture “The International Education Seminar ~ In Pursuit of the American Dream.” The event was co-hosted by KIF Osaka in collaboration with the US Consulate-General of Osaka-Kobe in Suita City. Upon Koyamada's arrival at University, he was greeted by Mr. Masahiro Inoue, KIF Okayama’s Deputy Executive Director. Several dignitaries were then briefed about Koyamada's speech: Mr. Yamamoto, Director of the International Education and Professor of the foreign language studies program who also happened to be born and raised in Koyamada's hometown of Okayama; and author Alex Bennett, Associate Professor in the Japanese Language and Culture Department, who was originally from New Zealand and is a senior Black Belt in Kendo and Naginata as well as a staff member of the International Affairs Department. Yamamoto gave opening remarks to over 200 freshman students and other guests, briefly detailed Koyamada's background, showed a two-minute trailer of Koyamada's Hollywood movies then handed the mic over to Koyamada. He opened his 40-minute talk by briefly sharing his life story and discussed how he turned his American dreams into reality. Although he knew nobody in the US, couldn't speak the language and had no industry connections he attained his goal in a short period of time. He also emphasized how studying, living and working internationally made him understand his identity and offered him different perspectives on his hometown and Japan. At the end of the lecture, he spoke about the vision of his charitable organization and what KIF Osaka is doing. Both Japanese and international students were thoroughly engaged throughout the entire time. After the lecture, Bennett joined Koyamada on stage and for 20 minutes did a talk-show style interview, where Bennett asked Koyamada a series of questions. Considering that the Japanese language is one of the most difficult languages in the world to learn, students eager to study Japanese must certainly have been impressed and inspired by Bennett's fluent, native-like Japanese. Koyamada and Bennett then opened the floor to the students for a 20 minute Q&A session. 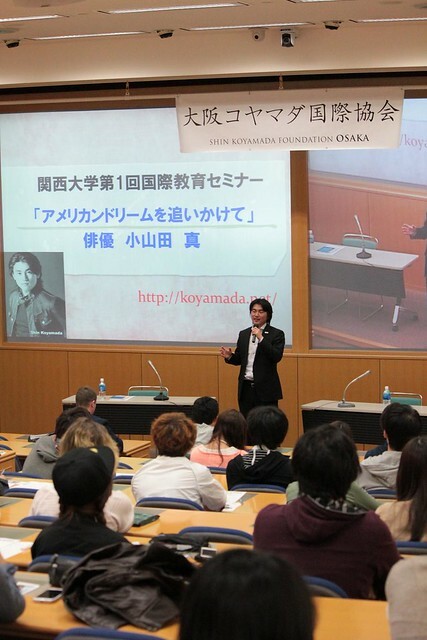 Director Yamamoto gave closing remarks thus ending Koyamada's successfully appearance at Kansai University.